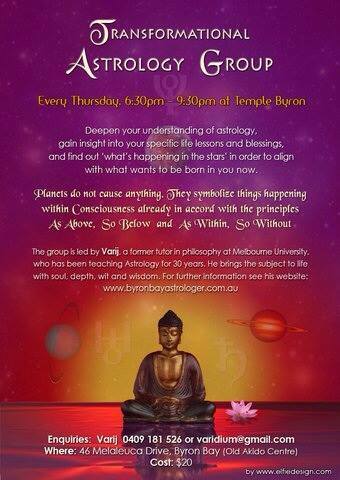 Varij teaches at the Temple Byron in Byron Bay every Thursday night from 6:30pm – 9:30pm. This is an ongoing group, open to all. If you are seeking insight into a pressing life issue, or simply want to check in for a personal or collective astrological tune-up, then this group is for you. The group is led by Varij, a former tutor in philosophy at Melbourne University, who has been teaching Astrology for 30 years. He brings astrology to life with soul, depth, wit and wisdom.